In 2012, Tanya Walker took the $200 her father loaned her to see a doctor. She was in the aftermath of a divorce and needed a prescription for antidepressants, she said. But her doctor in Texarkana found signs of hypertension and prediabetes — problems Walker knew she could not afford to have. Although her five kids were covered under Medicaid, Walker was ineligible for the state program and had no health insurance. Walker fell into the uncertain terrain of the health care coverage gap — she earned too much from her part-time job at a local Walmart to qualify for Medicaid, but too little to qualify for tax credits for private insurance under the Affordable Care Act, better known as Obamacare. Under Obamacare, Medicaid — the joint state-federal program that provides health care to low-income individuals — was intended to fill that gap by expanding to cover individuals who earn up to about 138 percent of the federal poverty level, or about $34,638 a year for a family of four. A recent ruling from a federal judge in Texas invalidated Obamacare, throwing the whole program into question; for now, the sweeping law remains in effect. First, individual states had to agree to expand their Medicaid program, and the federal government offered to pay for 100 percent of states' Medicaid expansion from 2014 to 2016 — aid that decreased to 90 percent by 2020. But a number of states, including Texas, fought the Obama administration’s mandate to expand Medicaid, and in 2012 the Supreme Court ruled states were not required to comply with the mandate. That left about 638,000 non-elderly Texans in the Medicaid gap as of 2016 — the most among the states that didn’t expand Medicaid, according to the Kaiser Family Foundation. Even after she got a job as a substitute teacher that paid around $800 per month — and offered health insurance through the school district — she still didn’t earn enough to pay the almost $1,000 a month for coverage. In Texas, substitute teachers don’t receive the same level of state contribution for health insurance as full-time teachers, said Amy Nix, director of human resources for Texarkana Independent School District. Walker, 51, said Texas’ decision not to expand Medicaid under Obamacare left vulnerable Texans with few options for health care. Many states, including Virginia and Louisiana, have since changed course and expanded Medicaid, while in other states — like Idaho, Nebraska and Utah — voters have bypassed their elected leaders to approve Medicaid expansion in recent elections. But Texas leaders haven’t budged on the issue and the state remains one of 14 with a coverage gap. To examine the role state and local policy play in issues related to income inequality such as health care, the Tribune collaborated with news outlets in Georgia, New York and Washington state. New York and Washington state both expanded Medicaid, and their rates of uninsured citizens — 6 percent and 7 percent, respectively — have fallen below the 2016 national average of 9 percent, according to Kaiser Family Foundation. Texas and Georgia, both non-expansion states, had uninsured rates exceeding the national average, by 6 and 3 percent respectively, in 2016. Advocates and experts say if the state were to expand Medicaid, the coverage gap would disappear and more than a million uninsured Texans would obtain health coverage. Like Walker, many of them are the parents of children who qualify for Medicaid or the Children’s Health Insurance Program based on their parents’ income, said Anne Dunkelberg, program director for the health and wellness team at the left-leaning Center for Public Policy Priorities. Although about 64 percent of Texans favor expanding Medicaid, the main support comes from Democrats — 82 percent approve — while 59 percent of Texas Republicans prefer keeping the state’s current Medicaid program, according to a recent survey from the Episcopal Health Foundation and the Kaiser Family Foundation. Texas has “one of the most restrictive Medicaid systems in the country,” said Tiffany Hogue, policy director for the Texas Organizing Project, a state nonprofit that advocates for low-income and working families. In Texas, adults who have children can receive Medicaid, but can’t make more than about 18 percent of the federal poverty level. According to Texas Health and Human Services Commission, a family of four can only make up to about $285 per month for parents to qualify for Medicaid. Adults without children can’t qualify for Medicaid unless they are disabled or pregnant and meet specific income thresholds. In other non-expansion states like Georgia and Oklahoma, adults with children can make up to 36 percent and 45 percent of the federal poverty level and qualify for Medicaid. Alisha Brummett, a 43-year-old mother of five from Katy, said before her husband found a job as a middle school choir teacher, the couple lived for about two years in the coverage gap. While her husband was attending school full time and working a part-time job, the family earned about $12,000 a year, Brummett said. For her, living in the gap meant looking for alternatives to traditional health care. Hogue said expanding Medicaid would save taxpayer money that’s being spent treating uninsured people who turn to hospital emergency rooms for health care — often when they have a full-blown health crisis. Under federal law, emergency rooms cannot turn away an individual based on their ability to pay, and about 17 percent of uninsured adults say the emergency room was their “usual source of care” in 2014, which was “substantially higher than adults with private insurance,” according to a report from the Kaiser Family Foundation. Parkland Hospital in Dallas provided about $880 million in uncompensated care in fiscal year 2017 — $100 million more than in 2013 — according to Fred Cerise, president and CEO of Parkland Health and Hospital System. He said most of the patients the hospital treated who couldn’t afford care came from outside of Dallas County. The federal government reimburses hospitals and other health providers for some of their uncompensated care costs through what is known as the Texas 1115 Transformation Waiver, but the waiver is set to expire in 2022 and it’s unclear whether it will be extended. People in the coverage gap can also seek care at federally qualified health centers — better known as community health centers — which are primarily funded through Medicaid and federal grants. Most community health centers offer primary care to uninsured individuals and charge patients based on their ability to pay, which protects people in the coverage gap from spending astronomical amounts when their medical needs become severe, said Mimi Garcia, director of policy and external communications for the Texas Association of Community Health Centers. In Texas, about 75 community health centers serve 126 of the state’s 254 counties, and about 1.4 million patients annually, according to the association. Nationally, almost a quarter of community health center patients were uninsured in 2016, according to the Kaiser Family Foundation. At Los Barrios Unidos Community Clinic, a federally qualified health center with locations in Oak Cliff and West Dallas, Chief Medical Officer Dr. Sharon Davis said they have to refer patients to other places, such as Parkland, if they need surgery or care from a specialist, and for those patients the waits can be lengthy. For years, Texas Democrats have filed legislation to expand Medicaid, but those measures have gone nowhere in the Republican-dominated Legislature. Hogue said she remembers lobbying with the Texas Organizing Project for Medicaid expansion at the Capitol during the 2013 legislative session. It was “dead on arrival” without support from Gov. Greg Abbott and Lt. Gov. Dan Patrick, she said. Even though other Republican-led states have expanded Medicaid, state Rep. Garnet Coleman, D-Houston, said he doesn’t expect Abbott or Patrick to change their minds on expanding Medicaid. State Rep. John Zerwas, R-Richmond, said for members of his party, Medicaid expansion is a non-starter because of the threat it could pose to their political reputation. In 2013, Zerwas authored HB 3791, known as the “Texas Solution,” which he said would have brought private marketplace principles to the state’s Medicaid program and given individuals incentives to live healthier lifestyles. The legislation would have allowed the state to receive federal money in the form of block grants to enroll individuals in a private health plan using a sliding scale subsidy, rather than expanding Medicaid to cover them. The bill garnered some bipartisan support in the House, with Coleman signing on as a co-author. However, it gained little traction among Republican hardliners and never reached the House floor for a vote. “They said, ‘No, I can’t support it. It looks too much like Obamacare,’ and that will kill me in my primary [election],’” Zerwas said. But health care emerged as a major campaign focus for many of those same lawmakers during this year’s midterm elections. Bob Stein, a political science professor at Rice University who researches voting behavior and elections, said health care and immigration topped voters’ list of concerns when they went to the polls in November. Stein said Republican county commissioners — who hear complaints from voters as their taxes rise to help pay for the public hospitals that serve people who can’t get Medicaid — could force more dialogue about Medicaid expansion. At Parkland, for example, about one third of the hospital’s funding comes from Dallas County taxpayers. Rep. Carol Alvarado, D-Houston, who has already filed a bill that would allow county commissioners to request a federal waiver to expand Medicaid within their jurisdictions, said she thinks there’s support among county elected officials to expand Medicaid on a county-by-county basis. “I think there are other counties throughout Texas that want to do this, but the state has been basically holding them hostage,” she said. Walker didn’t wait for Texas to improve health care for its low-income citizens. 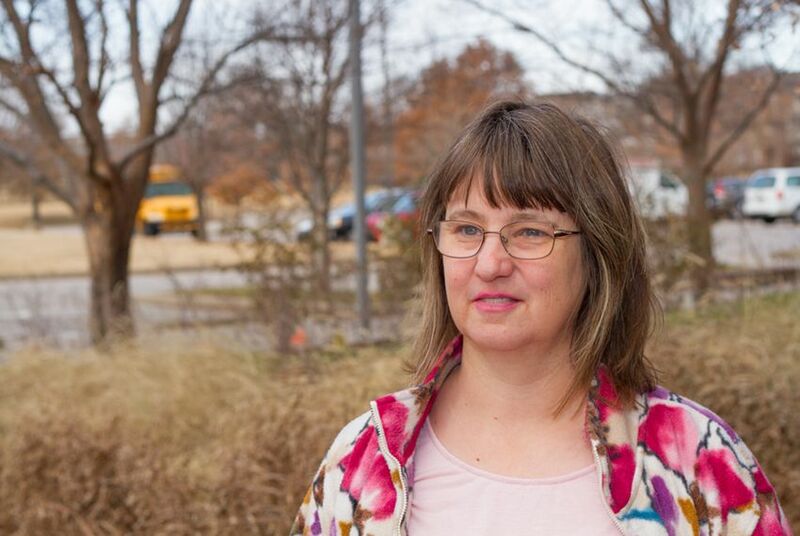 After spending two years earning her associates degree in nursing, Walker now works as a nurse at Kansas Heart Hospital in Wichita, Kansas, and receives insurance through her employer. Disclosure: The Center for Public Policy Priorities and Rice University have been financial supporters of The Texas Tribune, a nonprofit, nonpartisan news organization that is funded in part by donations from members, foundations and corporate sponsors. Financial supporters play no role in the Tribune's journalism. Find a complete list of them here. This story is part of the "State of Inequality" series, which was funded by the Ravitch Fiscal Reporting Program at the Craig Newmark Graduate School of Journalism. Read other stories from series here, including pieces from Georgia, Washington and New York.